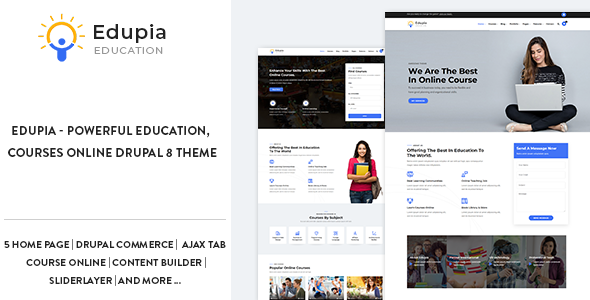 Edupia is a perfect template for Courses, Educational, Academy, Training College, University, Course Marketplace, any Education website to new heights websites. Gavias Edupia Theme is built with Gavias Block Builder, the amazing drag and drop builder allows you build professional block in just some simple clicks. In addition, with over many widgets integrated, building content is never easier. Edupia Theme is built with Gavias Content Builder, the amazing drag and drop builder allows you build professional block in just some simple clicks. In addition, with over many widgets integrated, building content is never easier. 5 Homepages Style, Edupia using unique design for each categories that help your site stand out your competitors. Install Edupia with our powerful Fresh Installation & Existing Installation with video guide. Edupia come with 3 different menus styles. Edupia looks great on any device, from mobile to desktop and beyond. Super Clean responsive design fits to any screen. Try resize your browser window and see for yourself! We offer free support for all our buyers via email gaviasthemes@gmail. Also Edupia come with a extensive documentation with HD how-to videos to help you get started with our theme.